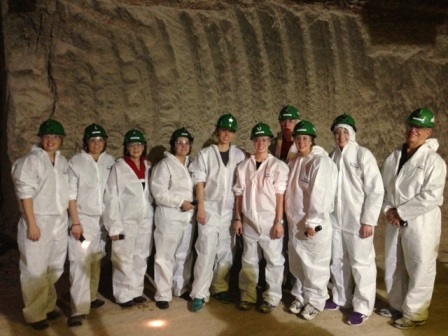 I have heard that potash was a natural resource and mined underground, never had I considered going underground to confirm those facts, until I was invited on a tour with the rest of my Nutrients for Life colleagues. We met in Saskatoon, Saskatchewan and drove about forty-five miles to the PotashCorp Allan Plant. Upon arrival, our guide gave us disposable white jump suits to wear to protect our clothing. I appreciated the protection but not necessarily the “flattering” style. Hard hats, protective glasses and flashlights were also issued. 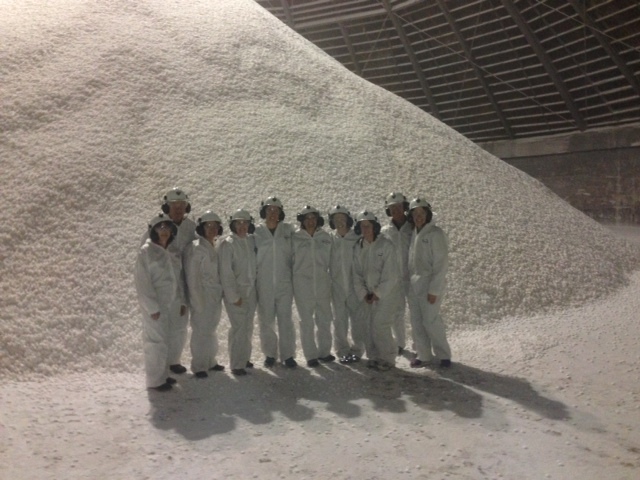 Nutrients for Life Foundation team tours the potash mine. 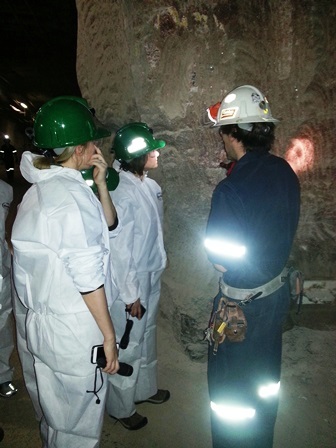 To experience the mining of potash, we had to travel one kilometer below the earth (gulp) in an elevator shaft. There are two shafts in this mine; one carried people and equipment up and down, the other carries the mined minerals. My colleagues and I got on the elevator and made the obligated mining and elevator jokes, as we took the three minute ride to the base of the mining shaft. With a few in the group claustrophobic, we were pleasantly surprised to find the mine, very large and open. The air quality was great and the temperature was comfortable 75 degrees Fahrenheit. With a geological engineer as our guide, we rode in a twelve passenger utility vehicle ten miles to an area they are currently mining. I had to keep reminding myself that we were traveling with nearly a mile of rock, clay and soil above us. Our guide educated us on the soil structure around the mine. He showed us where the clay line was in the mine, which is at the ceiling line. This is the very line they follow as they continue excavating in the mine. While we drove through the mine, I was curious about what kept the mine from collapsing (on me). 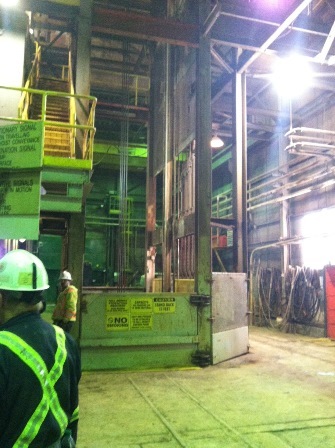 Our engineer guide explained that they use a stress relief way of mining, which allows for stable ground conditions. Looking up at the ceiling, we could see where they use rock bolts, rebar and timber cribs to support the unique conditions of the mine. He also explained how they create rooms that are supposed to collapse on themselves, taking the pressure of the other rooms in the mine. The word collapsing was a bit concerning, but I was reassured that we were safe! The mining machines were massive and very impressive! When operating, they bore a path 11 x 18 ft. A combination of salt (NaCl), potash (KCI), and clay came off the mine wall. As I held the rocks in my hand, I could see the three different minerals; the salt was white, the potash was red, and the clay was grey. The minerals are directly deposited on a conveyor, which carries it back ten miles to the shaft. Here they are elevated to the surface where the refining process begins. We survived our two hour tour of the mine, and returned to the surface with a new appreciation of the potash mining industry. I am glad to have had the opportunity to be in a mine, but I have to admit that I sighed in relief when I stepped outside and saw sunshine! Our tour would not be complete without seeing the refining process. 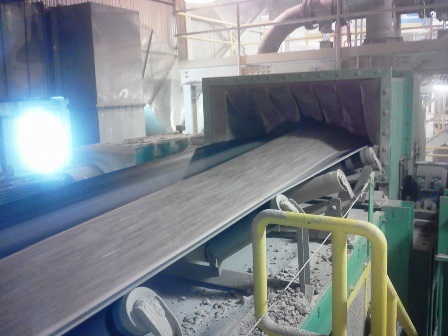 During this process the salt, potash, and clay are separated. With an engineer’s guidance, we weaved in and around a complex process of crushing, scrubbing, separation, compaction, and crystallization, which yields a pure form of potash. The final products are tested for purity and are stored or loaded onto rail cars. The tour was incredibly educational. Potash, which is the element potassium, is a natural resource from ancient seas. It is abundant in nature and fulfills many important functions in plants, animals and humans. As humans, we get our potassium from foods, such as milk, fruit, root vegetables and bananas. Plants get their potassium from the soil. When potassium levels have been depleted, potash is added to the soil and is then available for the roots to pull it up into the plant and its fruit. In a short four hours, I had traveled nearly a mile below the earth surface, seen the inside of a mine, walked between massive machines, viewed potash milling procedures, walked above railroad cars, all while looking like a giant marshmallow. It was a great morning. I would like to thank PotashCorp for the opportunity to view their facility and giving me an education in geology, fertilizer and engineering. I can confirm that potash is indeed, a natural resource mined underground! Just seeing the real world of potash mining underground is an eye opener. The technology today makes anything possible. The most fascinating part how they gained access to the mine by freezing a core section and drilling it out with specialized equipment. Then they installed those circular structure units that made a permanent shaft for them. It makes sense that potash is white being the salts of the earth but I remember fertilizer with muriate of potash – reddish in color. You could take a handful of a fertilizer mix and know potash was in it by the color. So having a choice of red or white potash was new to me. I was also surprised that the temperature was 70 degrees in the mines. Finally the distance of eight miles of road laterally was significant. I am claustrophobic but had no trouble with this experience. The open air jeep and not wearing the hood kept me comfortable through the experience. My most favorite treasure now is the rock sample from the mine! That is a truly enormous pile of potash there. Thanks for sharing such an intriguing story about an industry that the average person doesn’t know too much about.